I wish I got to kiss these cheeks more often or braid this hair from time to time. But distance separates me from my little lovely niece. 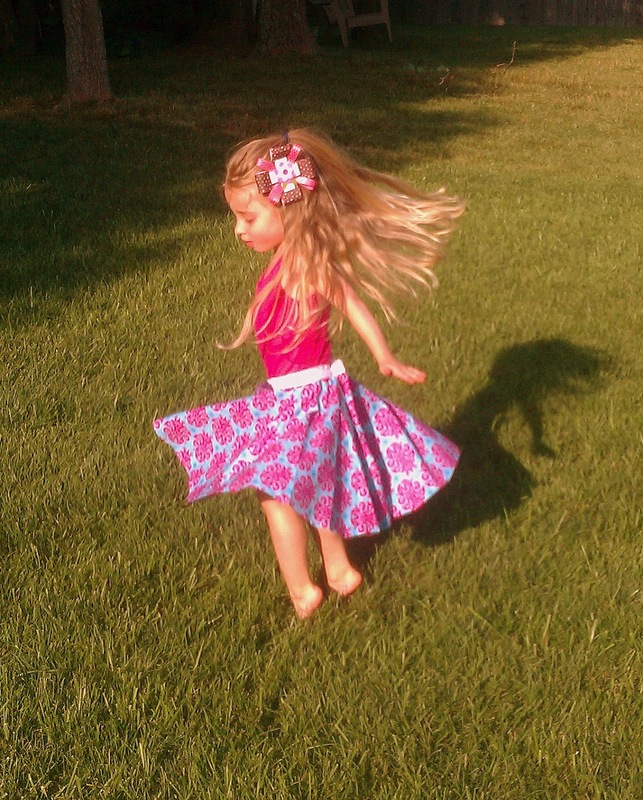 This month was her fifth birthday and here she is twirling in her new circle skirt her "Sissy" made her. This was one of the simplest patterns I have done, and I love it because you can modify the length and waist size to fit anyone. It takes a little over an hour...well it should. I always have glitches, tiny mistakes I make along the way, usually because I am distracted easily. But if the pattern was already made, and the technique learned, I don't know why you couldn't make 2 or 3 in an hour. Materials: 1 yard of quilter's weight 44" fabric, elastic (the width you want the waist band-it will be exposed), large paper to make a pattern, and coordinating thread. Measure the waist. Measure the length from the waist to where you want the skirt to fall. Now for the geometry of it all! Waist + 2in = the Circumference of the inner cut. To make the pattern you need the Radius. Example: My neice's waist was 17 inches. Measure from the corner, putting dots at the measurement of the radius. Then trace in to make the arched line. I started with one yard of 44" quilter's weight fabric. Fold the fabric twice. 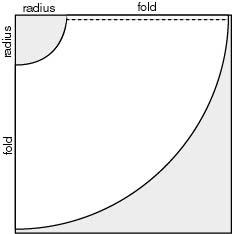 Place the pattern along the folds like shown in the previous diagram. Cut the pattern out of the fabric. Put a 1/4 inch hem in. (folded over twice, sewed twice). When you fold it over it does not look like a smooth circle, but as you sew it, the stretch in the fabric will smooth out the circle. Cut a piece of elastic 1/2 inch larger thant he waist measurement (not the waist +2 that you used to calculate the radius). Sew together and then sew the flap down to make a smooth waistband. Attach the waistband to the fabric, pulling the elastic tight as you sew. Pull from both sides, or you will tug at your needle or pull your machine off the table. Attach decorative ribbon in the same matter if you want. Here's the finished skirt on the table. All of the extra fabric is what makes it flow so nicely. First I laid it out into a pleat shape and found the center point. I put a few stitches (and back stitches) into the center to create a pleat. Then I stitched across the top to make it into a pleat. I had to make two of these to get all of the pictures. I hope you enjoy this tutorial. I am really excited about the simplicity of the circle skirt. I am already planning poodle skirts for a "Grease" themed Halloween!